Verizon Motorola Sholes not running MOTOBLUR? We'd been hearing rumors that the Motorola Sholes on Verizon wouldn't be running MOTOBLUR because it's to be a "Google Experience" device, and while that seemed silly at first, it certainly looks like the device Verizon CEO Lowell McAdam was waving around this morning was running stock Android. How can we tell? For starters, Blur has a different 3G icon in the menu bar, and different icons for several apps -- Calendar leaps out to us here. What's more, that certainly appears to be the default Android search box lurking back there, something that's not part of the Blur homescreen. 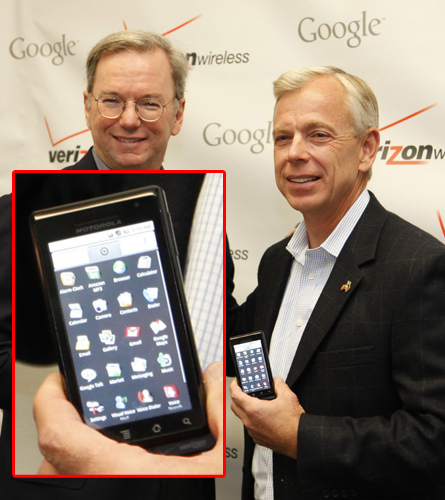 That's definitely odd, considering how big a bet Motorola seemed to be placing on Blur as its handset differentiator -- and doubly odd since the HTC Hero Eric Schmidt was holding at the same photo op was running Sense on top of Android. We'll have to see how this one shakes out when the Sholes is actually launched, but for now we'd say those rumors are looking awfully true.